I received a nomination for my first ever blog award. A bit of a shock considering I’ve only been blogging for a fortnight, but what a wonderful way to start 2012. I was nominated by the writer of Halfway Between The Gutter And The Stars, a blog that celebrates two things dear to my heart; the restorative act of writing, and someone finding the courage to walk a difficult path with honesty and awareness. I recommend a visit, and I want to thank them again for this nomination. It made my day! 1. I live on a farm that is sandwiched between a creek full of platypus and wild ducks, and a river where I like to picnic and barbeque with my neighbours. The river is filled with fish and eels, and I have found many beautiful crystals there. 2. One of my best friends is a fairy. No, really. Her name is Sokli, and she has a cheeky sense of humour, and a great love of life. Angels are well received, and widely believed in, but poor fairies are still considered mythical. I can assure you this is not the case! 3. If I could have any pet I wanted it would be a dragon, or a unicorn. For now I content myself with two dogs, and a paddock full of cows. 4. I love to cook, but more than anything I love to cook for others. I believe in real food; fresh, seasonal, organic and home-grown if possible. I often wonder when farmers and corporations will realise that if it poisons something in the food chain, it’s also going to poison us! 5. I write endless lists, thoughts and plot developments on the backs of envelopes. Writing is a not-so-secret obsession. 6. A giant carpet python lives in the roof, directly above my writing desk. I have become used to his bumps and hisses, and his daily routine of sunning, sleeping and slithery adventures which always start by him snaking his way down the frangipani tree that tucks up against the gutters. bruises you can touch – poetry from the heart. I love the raw honesty and bravery of this blog by the talented Carly-Jay Metcalfe. Until it kills me… – Sarah the mortician’s delightful musings on death. And life. Cody Phillips – Writer’s Life – an up and comer, with a quirky Aussie bloke-humour. This entry was posted in Writing and tagged blogging, life angels, Nicole Cody, Nicole Cody's blog, organic food, permaculture, VBA, versatile blogger, writing by Cauldrons and Cupcakes. Bookmark the permalink. I’m not surprised at your award as your posts are easy to read and informative. I found your blog a few weeks ago via FB. Yours is the the first RSS I have ever signed up to and love receiving them. Hi Nicole, Congratulations gorgeous one! 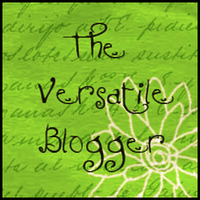 You are my introduction to blogging and I am loving your variety. Am enjoying your down to earth, good common sense advice for a healthier, vibrant lifestyle. You are also prompt me to write too which is long overdue. Thankyou for that bella! Congratulations! Especially two weeks in. And thank you for nominating me! Your Blog is like an adventure! You write in such a musical way and I feel as if I am with you, on the farm with the cows and platypus. I just found you through Facebooks Theosophy Watch. What a lovely blog that lightens my heart. Is the fairy like the one in storybooks? Oh, I think she is a little more naughty and a little more wise than that. Yesterday we had the local monks and nuns over to chainsaw timber for their winter warming, they bought a feast to share …… I had two coloured merino fleeces to give as one of the nuns spins wool, a jam melon, a jar of our own honey, grape jelly, cumquat marmalade. A nun saw a cordaline plant and we pulled off the dried leaves for her to basket weave, they loaded 4 full trailers, and a tip truck of eucalyptus logs.They left us a hamper of homemade lemon lime cordial, preserved lemons, lemon chutney, preserved artichokes, a lemon lime marmalade, quiche, an apple pie and boiled fruit cake! I was rather over whelmed by what they gave us and deeply touched. But the boiled fruit cake bought me to your blog. And the story of Mr Mac…….. I sit in the very warm autumn sun, I watch a gust of wind blow autumn leaves from a deep red claret ash, an orange Manchurian Pear…. A glorious day (a little to glorious!) and I think of those in Mr Mac’s shoes. What a wonderfull life you are spending!my best wishes to you.